Bindi Sue Irwin is an Australian teen actress, television presenter, and daughter of The Crocodile Hunter star Steve Irwin, and Terri Irwin. SeaWorld has just hired Her as an ambassador for lack of a better title. She will be hosting shows and doing appearances for the SeaWorld Parks all over the world. TMZ reported some very erroneous and slanderous statements about SeaWorld and the effects of Blackfish. TMZ said that Bindi is being put in SeaWorld to “Save” the company and that blackfish ruined their concert series, Bands, brew and BBQ. 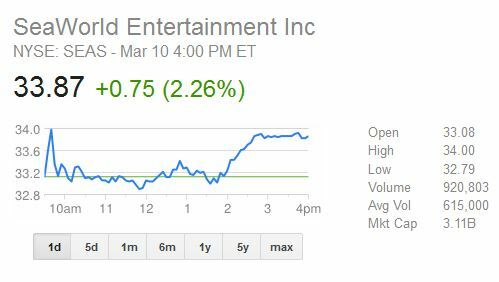 TMZ went on to imply that SeaWorld is not doing well financially but as You can see from the stock quote on March 10, 2014, SeaWorld is not only doing well, they are doing better than almost all public Companies. And according to SeaWorld, they have recorded record profits since the Blackfish documentary was released. Should I buy a Timeshare in Orlando?